The [Report of the Presidential Commission on the Space Shuttle Challenger Accident] , provides the facts used to develop this example. Though investigators may have used “5-Whys”, there is no specific evidence that this was the selected method. 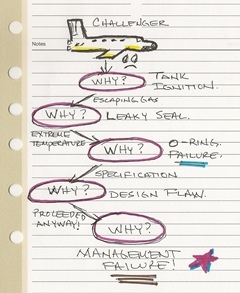 Following is the “5-Whys” analysis tree based on this information.